​Oy! It the Crocodile Hunter Stev- I mean Grittle. And I have come across a big wallaby that is, in my opinion, is breaking the already broken 3v3 and 4v4 team games! Just one secured sectors from these fellas can have your mutilated dead body crawling with Kingtigers and Stuka Trucks! These guys are even more deadly than em' Nile Crocodiles I met a few hours back! Now how to wrangle these caches of pure satanic evil? Though not that harmful by itself, this beast is literally Satan when with an OKW teammate! So the fuel and munition drops are only 25% as effective for the OKW than a Wehr Teammate! So there ya have it! I more step to balancing out the unbalancable! I hardly doubts it caches that "break" team games. If a Wehr player invest ressources into supporting his teammates with caches or Supply drops, said teammates should recieve the bonus attirbuted to them - either 100% or 66%. Now, Supply drops currently give 50 fuel no matter who picks them up, that may be changed, but Caches? Nah. Same thing could be said about allied cache spam. No one complains about that though. 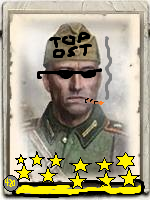 I think the difference is the OKWs economy is not designed to go beyond a certain point and Wehr caches can push beyond the point without maximum map control, so while Allies can cache spam for maximum lol it's not going to supercharge their economy in such a way as it would for OKW. That said you're perfectly right - caches benefit the whole team. If it needs to be toned down for OKW to 66% then tone it down, but if we're going to make Wehr caches affect Wehr only they need to be cheaper or generate more fuel than their Allied counterparts because you're simply getting less out of them. either 100% or 66%. Now, Supply drops currently give 50 fuel no matter who picks them up, that may be changed, but Caches? Nah. Same thing could be said about allied cache spam. No one complains about that though. Naww be, its okay, let them get full fuel caches. its alright. I mean, Its not like they have access to non-doctrinal heavy tanks, right??? ?